During the first half of the fifties bodies on lightweight front engine chassis formed only a small part of Harrington's output. The Crusader represented a new direction and was a pivotal point in Harrington design; the Contender integral vehicle range which had been running since 1952 ceased production as Crusader started. The name, the first in a succession based on men at arms was a clue that this was the start of a fresh design sheet and a change from the past policy of fitting a variation of their proven heavy weight designs to the lighter chassis. 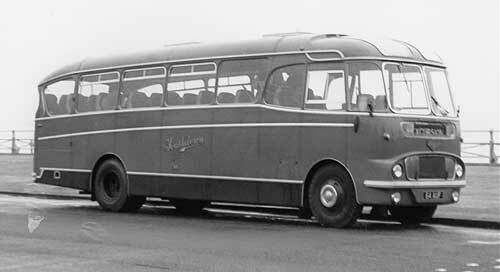 It was the first design that was intended only for lightweight chassis such as the Commer Avenger, Bedford SB and Ford Thames. There was no Crusader version on a heavy / medium weight under-floor engine chassis. It represented a more concerted effort to gain ground in the lightweight market, dominated by Duple. Perhaps fortunately at this time the Duple Vega range was looking unfashionably bulbous and the Crusader, while not exactly sleek was certainly rakish. Also it is likely that Harrington were aware that this segment of the market was about to expand with Ford about to enter the PSV arena and Bedford offering a Leyland engine option for the SB (which was of great interest to Grey Green, a long standing Harrington customer). The Crusader ran to four marques and it is rare to find full agreement that any of the four were really good looking. The booby prize probably goes to the rare MkIV. By the time this came out the Crusader had tried to metamorph into a baby Legionnaire - indeed had Harrington continued in business it is likely this would have been much more obvious. The Mk IV also had a dash of Duple Bella Vista thrown in around the sides; the successful Duple design having vanquished nearly all pretenders to the lightweight throne. The Crusader mark 1 was introduced at the 1958 Commercial Motor Show and was an interesting styling watershed. It drew heavily on the general styling of the still current Wayfarer Mk4 but at the same time displayed many of the features that barely a year later would be drawn together harmoniously into the Harrington Cavalier. There is no doubt that the Cavalier, yet to be announced at this time, was one of the most important new coach designs of the era both for Harrington and coaching in general. The Crusader has been largely ignored by transport historians but has its place as the link between Harrington's production in the 1950s and the new decade. Pictured, standing awaiting delivery is Bedford, TWN 741. It is an early body number, 2079 and on chassis SB 8 69836. It is destined for Davey of Swansea. One of the important features pioneered on the Crusader and later used on the Cavalier was the introduction of a very much more sophisticated window pan for the side windows. This was not only stronger than the flat panel of the Wayfarer, but also managed to impart an air of quality, thanks mostly to the specially made rubber extrusion which sat neatly into the frame. The large one piece front and rear panels as well as the front and back roof sections, were entirely made out of fibreglass and the novel angular shape of the rear window surround took full advantage of the versatility of this medium. Certainly the rear looked very "modern" compared with previous Harrington designs and those of other manuufacturers who, with varying success, were still struggling to find a look different from the rounded "dome". It was clear that Harrington realised this was the strong point of the design and advertisements for the Crusader usually featured a rear angle. Crusader frontal styling was clearly descended from the Wayfarer IV but surprisingly, the front grille was a bit of a throw back to the Wayfarer Mk3; generally thought to be an unsuccessful design. In the Crusader great efforts were being made to keep both weight and costs down. The seat frames were simple square section tube and this formed the seat legs too, instead of the usual "deluxe" aluminium casting. "Formica" plasic laminate was used more extensively than the Wayfarer IV, where it had first been seen. It was used not only on the plywood that formed the dash board but along the interior without any backing at all on the inside of the frame around the windows. Below the window line the interior lining panels were made of Rexine covered hardboard - something not seen since the end of the wooden framed bodies. The Crusader may have been metal framed but without the aluminium inner panel the general solid feel that Harrington coachwork had previously imparted was more obvious. When diesel versions of the Crusader were standing ticking over they used to shudder dreadfully. Although this was no more than contemporary lightweights from other manufacturers, the fact that many customers had other sorts of Harrington coachwork meant that the Crusader was viewed with slightly less enthusiasm by drivers and passengers alike. This may also be a reflection on the engines fitted to the diesel version of the Bedford chassis, of course! 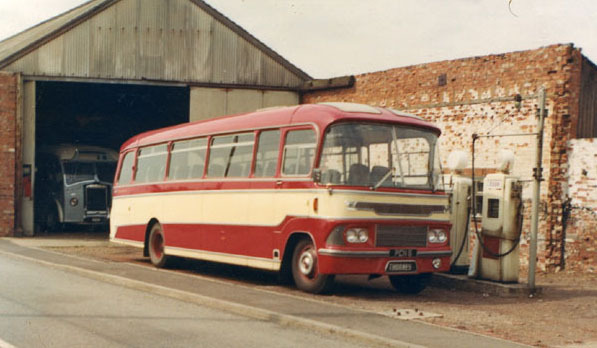 Despite Harrington's strong links with the Rootes group, the first bodies were on Bedford chassis, a Ford example following about six months later and Commer a full year behind. Unlike Duple, Harrington did not feel the need to change the name of the body style depending on which chassis was used. Whether this was a help or a hindrance is debatable. It certainly gave the impression that Duple made a lot of different models when in fact it was remarkable what could be done with different trim and a name script! 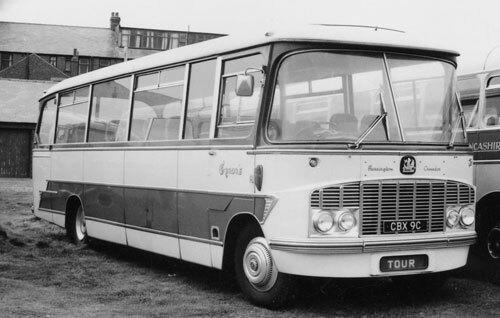 The introduction of the Crusader coincided with an expansion in engine options for the Bedford SB range and SB8 signifies that a Leyland diesel engine was fitted. The difference between the Bedford and Ford varieties was virtually indistinguishable but the Commer suffered badly from chassis dimensions that required the whole floor line to be set higher. To cap it all, the main buyer for the Commer was Southdown who chose a rather basic and disjointed form of bright trim together with a colour scheme that did not help to break up the tall slab sides. 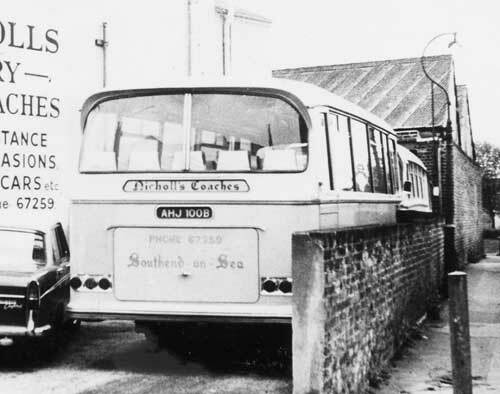 As can be seen in the photograph there was room above the grille for a destination display and what appears to be a separate plaque with Southdown script but which is in fact a large cover for the radiator filler. Admittedly the Bedford does have bright trim around the front side lights to enhance the corner panels but the difference in body height can be judged from the empty space above and below the side lights on the Commer. Perhaps the most significant feature of all the Commer Avengers was that only the first style of Crusader body was used. 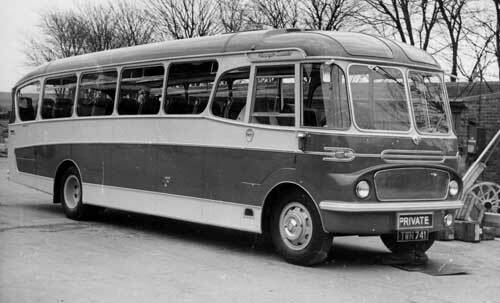 In the past, various writers have speculated that it was not possible to fit the later body to the Commer chassis. This is unlikely because Harrington never had any problem adapting other styles to differing chassis. Indeed, body specification sheets issued by Harrington make it clear that all four different versions of the Crusader were suitable for the Avenger chassis. What is more likely is that in fact, sales were limited. The only big order had come from Southdown - who were infamous for wanting repeat orders to match the appearance of previous ones - thus not risking making the older coaches look totally out dated. So it seems probable that the "incompatible" myth grew up as a result of 15 mark 1 style bodies delivered in 1962 , just when the Crusader mark 3 was being released. 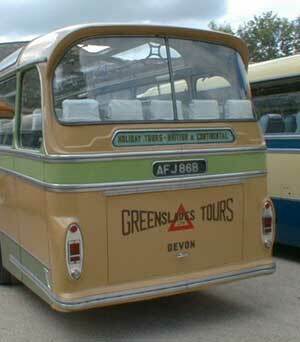 The coach pictured above is body number 2673, Commer Avenger IV 94A0520 registered in 1962 as 64 AUF. Photographs of the Crusader, (left) and the Cavalier (right) demonstrate the very close relationship between the two styles and how much the Crusader was a precursor for the Cavalier. The roof line of the Crusader had a much more pronounced curve down to the rear so the side and rear windows are not nearly as deep. As a result of this Crusaders had a single perspex panel set into the roof to improve light in the rear seating area. In retrospect the small windows of the Crusader do have a certain sleek style to them, not unlike the effect of a coupe roof on a car compared to a standard saloon. The number plate box on the Crusader is in a vulnerable position since it would be always at risk of damage from heavy luggage being swung into the boot. The Greenslades Cavalier does not have the optional roof marker lights which were hand made in copper for each vehicle. The Crusader uses the same standard square rear light assembly but lacks the aluminium embelisher which on the Cavalier incorporates the reversing lights and indicator. If the back of the Crusader Mk1 was the shape of things to come with the Cavalier, the front had been obviously heavily influenced by the Wayfarer Mk4. Although a batch of 20 Wayfarers were made for Maidstone & District (by special request) at the end of 1960, Harrington lost no time in punctuating the end of that era with a restyle of the Crusader for the 1961 season. The revised appearance seemed to meet with general approval. For the first half of 1961 the factory was at its busiest with Crusader production, despite the success of the Cavalier which was also pulling in large orders. 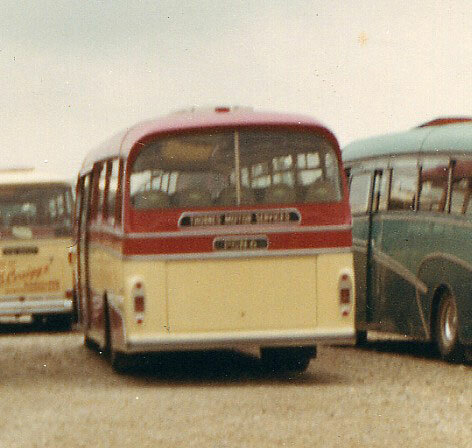 The back end of the coach was considered to be generally acceptable. Although gaining the patent cantilever opening boot lid, little else was changed. Forward of the passenger door though, was a different matter. Perhaps fortunately for the success of both models, although there was a family resemblance in the general style, no attempt was made to make a Cavalier copy. 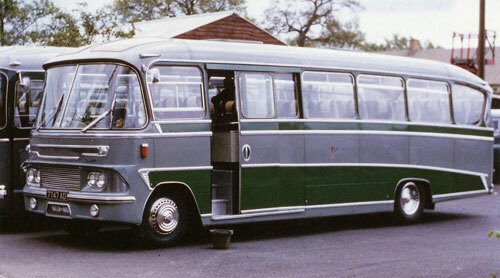 The side appearance was much more conventional than before and Harrington abandoned the idea of the front section of the coach as a separate "pod". The "traditional" stepped waistrail which was so successfully revived on the Cavalier was not used although it might be argued that it did make an appearance in the depth of the windscreen compared with the side panels. Others would argue that the use of an aluminium "speed flash" trim at this point was just to disguise an annoying mismatch of the panel height. Most significant of all was the use of large curved glass windscreens, like the Cavalier, mounted directly into the bodywork now that the designers were freed from the legislation that required them to have an opening front window and therefore a window frame. The sides of the screens were reverse raked in a style finding popularity in private cars at the time. The grille opening was vastly improved by simple horizontal chromed strips and twin headlights - the symbol of modernity and the marvel of small boys though out the land. With revised screens and grille at last it was the end of the appearance described by one enthusiast as "like a dead fish". And I am hard put to disagree. Slightly surprisingly it was also the end of the step in the roof line, first seen on the Wayfarer mk 4 as a device to force air into roof mounted vents. This would continue until the end on the Cavalier and Grenadier and would later be seen again as a subtle styling feature on the Duple Dominant of 1972. One small point to note is the shape of the rear wheel arch. Although not obvious in this photograph, there was in fact a removable panel here that allowed the wheels to be removed. Some operators found this a problem and specified ordinary round topped wheel arches, which tended to spoil the appearance in more ways than one because the side trim strip was required to run higher and then curve down to the rear where a larger "speed flash" was used. At the back, Cavalier style rear lights with an aluminium finisher incorporating a reversing light were used but still just flat onto the original fibreglass panel. The lift up cantelever boot door also replaced the two hinged items. 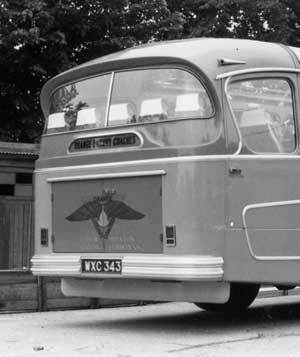 The coach pictured above was on a Ford Thames chassis, 570E 510E58654 and was body number 2383 delivered in April 1961 to Talbott of Morton in Marsh. More photographs of the Mk 2 Crusader are in the photo section for King Alfred 326 CAA in the preserved vehicle listings. The Crusader Mark 3 was a restyle that came at a very busy time for Harrington. It coincided with the introduction of the Grenadier model. The factory was at full stretch and shortly afterwards production began on a large order of 25 Cavaliers for Ribble and 14 Bedford Black Marias for the Metropolitan Police. Against this background it is probably surprising that it was justified as a project at all. From a list of body numbers it has not been possible to identify which vehicles were built in this style, but assuming all to be Mark 3 then only about thirty were produced before the Mark 4 design was introduced. It was rarely photographed except for the batch of eight for an unusual customer, Northern General. Then, in 1965, the last full year of total production (and after the last MkIV had been made) a batch of fifteen in this style were built for Barton. They were fitted with power doors. Perhaps this was some way of using up left over components for only Grenadiers were built after this until the end of new coach production. The change to the Mark 3 was achieved by dipping into the Cavalier parts bin. The side appearance was improved by longer windows which gave a less cluttered appearance. The back was in effect now exactly the same as the Cavalier. Unfortunately the Grenadier had just arrived which started to make the Cavalier look dated! However since only a handful of Grenadiers were made during 1963, this was not immediately obvious. The new Crusader had finally lost the pronounced slope in the rear roof line, as a result of the increased height of Cavalier type rear screens. The back end of a coach is rarely photographed but fortunately Philip Thornes of Thornes Motor Services of Bubwith has come up with photographs of ex Northern General PCN 6 which Thornes once operated. These clearly show the use of the Cavalier rear panel with the moulding for vertical rear lights. Unfortunately none of the mark 3 production have survived into preservation. The last re-style for the Crusader represented a fundamental change with a return to composite rather than all metal construction. For years Harrington had insisted on the virtues of their all aluminium construction and therefore it is difficult to see that any advantage was gained abandoning this method. However, aluminium construction had been pioneered in the years following WW2 and then aluminium was very cheap. By the early 1960s Britain was again in a period of political and economic turmoil. Costs and the drive for even greater weight savings required a different approach to construction methods. Pictured is body number 3128 on Bedford SB 13 96782 chassis. The Mark 4 was an attempt to pull the Crusader into line with the Legionnaire family look. Perhaps it is just as well Harrington stopped when they did, because plans were in progress to move the Cavalier and Grenadier mid engine body style in this direction too! The style is best described as a bit of a Frankenstein's monster since it really seems to have gone to town with each area badly resembling parts of something else. It adopted the Legionnaire style of polished uprights between the square edged side windows glass. Perhaps the lack of length and sliding door is the reason it looked less like the Legionnaire and more like the side of the Duple Vega, a design now getting a bit long in the tooth itself. The new style side windows lessened the differential depth between the windscreen and instead of sub-consciously suggesting the familiar stepped waist rail, the trim by the bottom corner of the windscreen now looked like two people had started at either end and failed to meet in the middle. At the front the screens remained as before but the grille became very like the Legionnaire although spoiled by the effect of the headlights mounted at the very bottom. To accommodate the dimensions of the front engine chassis the whole front panel was quite severely curved which, given the overall resemblance to the Legionnaire (often described as "box like") only served to make the Crusader look strange. The peaked cap look above the windscreen tended to give the frontal appearance an overall belligerent effect, quite contrary to that achieved on the Legionnaire. Just visible in the photograph above is the diagonal "kick up" to the rear side window as used in the Grenadier. In fact, the back panel itself was derived from the Grenadier. The MkIV was 2.5 inches wider than previous versions. The boot lid was simple, lacking the elaborate handles of the Grenadier or Legionnaire. The registration plate was above the opening, the same position as the Cavalier, below the rear trim.